Thank you for joining me as we count down to the MFT release. We are three days away from the big day! All the new Stamps and Die-namics will be available on Tuesday, December 5 at 9:00 pm EDT. Be sure to check out the MFT Blog to see all the new items being revealed today. Don't forget to leave a comment on the MFT Blog countdown posts, YOU could win one of the five $75.00 gift vouchers. 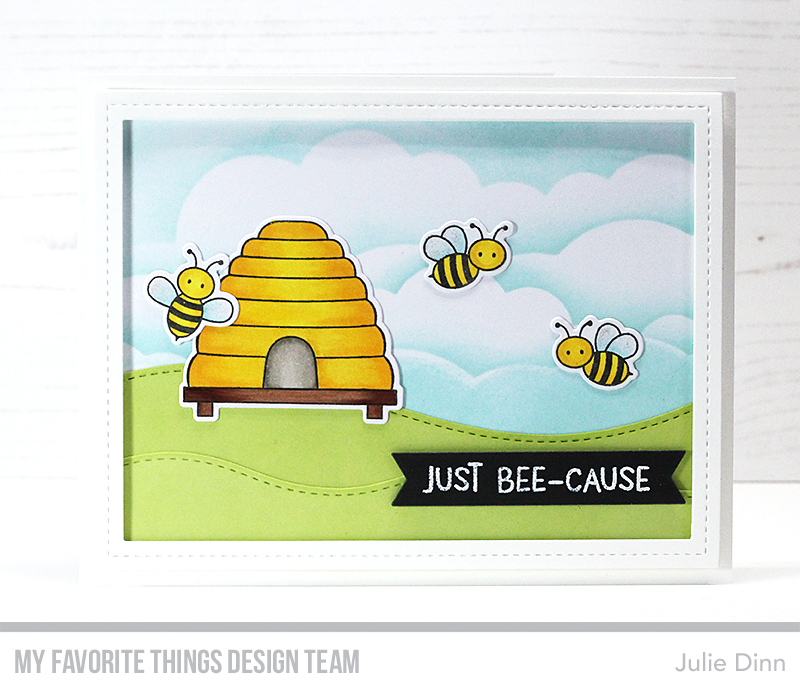 I have a sweet card to share with you today. It features the new Meant to Bee stamp set. This is such a cute little stamp set. The images were stamped on X-Press It card stock and were coloured with Copics. I added a touch of glitter to the bees wings with the Wink of Stella Marker. The sky was created with the fabulous Cloud Stencil and Summer Splash Premium Dye Ink. I used the Stitched Snow Drifts to create the hills. This card is marvelous! It makes me long for warmer weather. I like the colors, coloring and design. AWWWHHH, this is just too CUTE! Love your little hive scene. This is one of the cutest sets in this release and your card is lovely. Super sweet card!Love the background! An adorable card. Makes me yearn for spring.